For most of the 20th century there was one motor accessory manufacturer who's name stood for top quality British Engineering. 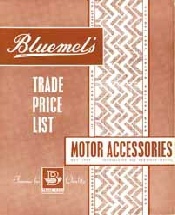 That company was Bluemel Bros Ltd.
At one time they manufactured a huge range of superb quality products including OEM steering wheels, auto & cycle lamps & a huge range of accessories for grand touring cars. They were one of the few regular suppliers to the bespoke coach builders of the 20's & 30's, catering to the likes of Rolls Royce & Bentley. 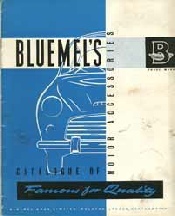 However as the coach built motor business shrank dramatically with the introduction of serious mass production in the 50's so Bluemel's fortunes turned down. By the 1960's their main product was number plates, suplimented by various odds & sods. 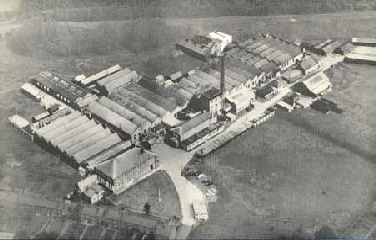 The original company closed in the late 1970's. 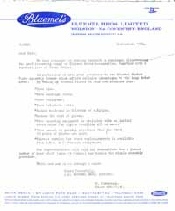 This letter was sent out to accessory shops throughout the UK extolling the virtues of the "New" Bluemel's Number plate assembly Scheme. This allowed any "Junior member of staff (male or female) to handle this simple procedure" and supposedly offered huge profit making opportunities. This version published in 1964 mainly focuses on Number plates & a few accessories like stickers & drip trays. It does however make a very nice reference as to what types of number plates were being offered in the mid 1960's. 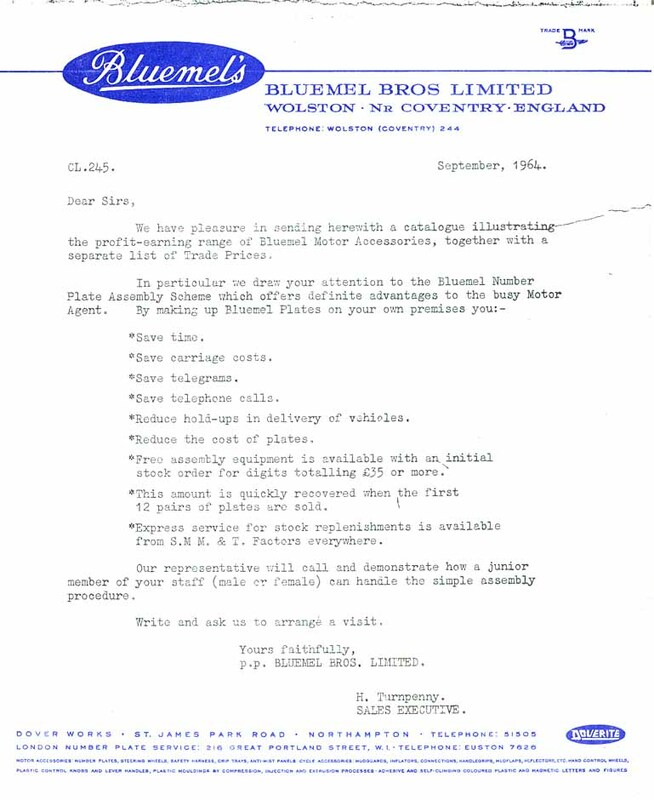 At this time Bluemel's were still the "Premier" quality number plate manufacturer. Full price list dated 1964.